Ford Motor Co. is recalling 1.1 million full-size pickups in the U.S. because straps securing the gas tank to the vehicle could rust, allowing the tank to come loose and drag on the ground. 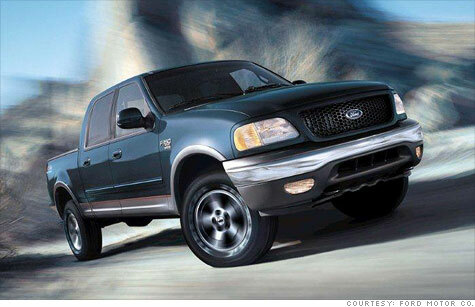 The recalled trucks include model year 1997 through 2003 F-150 trucks, some model year 1997 through 1999 F-250's, and some 2002 to 2003 Lincoln Blackwood trucks -- a luxury version of the F-150. The trucks being recalled are in states with cold climates where road salts are commonly used. The salts can hasten corrosion of fuel tank straps that hold up the gasoline tank. Dragging gas tanks? Not good. dual fuel tanks on a bike, co2 paintball tanks? Cut off plastic end tanks and weld AL end tanks.